THE UNITARY PATENT is a subject we have been covering for many years, since before it was even known as anything “unitary” (words like “community”, “EU” or “European” were more common a bunch of euphemisms at the time). The UPC is definitely not for the EU or for Europe. It is not for Europeans or even for EPO staff (who are typically European scientists); rather, UPC is for prosecutors/lawyers and for mega-corporations (their clients), billionaires and Battistelli, who is dangerously close to them (see his political affiliation and professional background). The UPC must be stopped and EPO examiners too should work hard to stop it. Nothing would upset Battistelli more because his interests are often the very opposite of EPO interests (for instance, systematically lowering the quality of patents). If the UK does not ratify now, the whole UPC/UP project may simply evaporate. The benefit to that part of UK industry that is not part of IP Federation’s self-selected cabal will be lost. In any event, their position seems to me to be pretty sound. Why would anyone want a patent that may not be valid in one (or more) jurisdictions? That’s exactly what those who insist on ill-conceived quick ratification are asking for. There are so many questions that cannot be easily answered and, for which, the answers may be challenged in future even if they are answered that certainty is required. The easiest way to be certain is to NOT ratify. Status Quo maintained. If the UPC system can be adapted to make it certain (unchallengable) that the UK is/can be clearly in or out then all well and good. One person said that “IP Federation positions are almost always taken up by the CBI (who don’t have much expertise in the relevant areas) and they DO represent all of British industry.” No, they don’t. “UK participation in UPC is silly,” Henrion notes, considering the fact that the UK plans — as per the referendum — to exit the EU. Patent law specialist Deborah Bould of Pinsent Masons, the law firm behind Out-Law.com, said that it would seem “politically unrealistic” to expect the UK to pass legislation giving effect to the UPC Agreement if its participation in the UPC and unitary patent system was not guaranteed to continue after the country leaves the EU. Bould was commenting after Benoît Battistelli, president of the European Patent Office (EPO), suggested that if the UK ratified the UPC Agreement before leaving the EU it could be allowed to continue its participate in the new system after its exit from the trading bloc. He suggested, though, that continued participation post-Brexit would be subject to the outcome of negotiation between the UK and EU countries. “The UK’s participation in the new patent system is a major part of its attraction, and its involvement was a factor in the decision that London should host a branch of the Central Division of the UPC. That said, subject to a possible amendment of Article 89 of the UPC Agreement, the Agreement is worded in a way which makes it legally possible for the UPC framework to continue without UK involvement,” he said. Patents are granted for the UK by the Intellectual Property Office (“IPO”) pursuant to the Patents Act 1977 and the European Patent Office (“EPO”) pursuant to the EPC. There is not yet such a thing as an EU patent but there is an agreement to set up a Unified Patent Court (“the UPC agreement”) and legislation to permit the EPO to grant patents for the territories of most of the member states of the EU including the UK, France and Germany to be known as unitary patents. As Parliament has already enacted legislation to enable the Secretary of State to ratify the UPC Agreement and the statutory instrument giving effect to ratification has already been drafted (see The Draft Patents (European Patent with Unitary Effect and Unified Patent Court) Order 2016 10 March 2016) it is also possible that the unitary patent and Unified Patent Court will come into being before the UK leaves the EU. However, the UK would cease to be party to the UPC Agreement upon our departure since the Agreement is open only to EU member states. The only intellectual property right affecting the software industry that would actually cease to apply to the UK upon our departure would be the EU trade mark. The courts in the UK that have been designated EU trade mark courts will lose their jurisdiction over EU trade mark matters. However, registrations under the Trade Marks Act 1994 would be unaffected and EU trade marks would continue to apply to the rest of the EU. It doesn’t matter how much these patent law firms try to promote the UPC, Brexit is a real slap on their face. Days ago the EPO’s Twitter account again promoted the dead/dying UPC using Battistelli's lies and lobbying in Munich. Are they not even trying to hide their meddling in political and legislative matters? What has the EPO become, a think tank? Good argument from Millipede. UK ratification improves the negotiating position of the UK, trying to squeeze a good “deal” out of the EU as it negotiates its exit. Who in the UK could be against that? So Theresa, hold back on Art 50 by all means but, if you care about the UK’s reputation in the world, screw your courage to the sticking place and get on and ratify the UPC. There is no reason not to, and every reason positively to do so. But with time limited after Art 50 notification, might not it be to May’s benefit to hold off on ratifying the UPC in return for some other concession? Joining and then (messily) leaving serves her no purpose but eases everyone else’s interests so is a good bargaining tool. Why give it up a pawn for free straight off when you have bigger treaties to negotiate from weak positions? Just think of the unitary effect scope when the two years delay will lapse should no agreement be found ? Remember how Serbia and Montenegro separated ? Patentee had to register their former patent to the Montenegro IP office. One could expect that a unitary patent territorial scope be reduced when the UK formally leaves EU, but will it be. Then, hopefully some UK laws would provide for a similar registration at UK IPO (and what about Scotland if a Scottish IP Office is enacted at some point ?). Overall, the british parlement might spend the next two years just adapting all laws to the Brexit. No need to add special legislations for a short lived unitary patent. UK courts would not have juridiction on former unitary patent over the UPC countries territories. Conversely, UPC would not have jurisdiction for former unitary patents over the UK territories. What about pending actions before the UPC Court of first instance in the London section and in other UPC countries ? and before the Court of appeal in Luxembourg ? Think of the clause “as an object of property” if the first applicant is from UK: then, the unitary patent applicable law would change upon the UK leaving with German law applying in a number of instances. This might be bad news for international company having their UK subsidiary applying for EP patents. English common law fact-finding has a role to play, in keeping litigants honest. Discovery and cross-examination are the only effective tools to stop parties in court from trotting out a string of porkies. How sad then, that a mainland European can’t wait to see the back of English common law fact-finding procedures. Some of the suggestions here are laughable. A quick ratification from the UK to get the system up and running, with the option then of the UK leaving the system in due course (as per Millipede’s “win-win”)? I don’t think so. Back to the drawing board I am afraid…. Let us hope that “Brexit means Brexit” is good old fashioned UK politics in which success is like rowing, staring fixed.in one direction while moving rapidly in the opposite. I do not think that the “pro-UPC” commentators here are necessarily motivated (solely) by the thought of future profits. Remember, there will be many in the IP profession who will have invested considerable amounts of time and effort (as well as resources) in preparing the way for the advent of the UPC. Not wanting to see all of that go to waste is surely an understandable emotion, so let’s not cast aspersions where none are really necessary. It is certainly sad that yet another attempt at “harmonising” patent litigation in Europe looks set to be consigned to the waste bin of history. Nevertheless, at least from my perspective, there are some silver linings. Foremost amongst these is the possibility to re-open the issue of harmonisation of national patent laws. One of the biggest failings of the current UPC Agreement (and associated EU Regulations) is the fact that it leaves too many issues open with regard to applicable laws (for infringement and other matters). This can only lead to the kind of uncertainty that litigants so dislike. Lots of discussion on what companies will do – mainly from the point of those in the profession. What drives companies’ decisions? Money. Contrary to the impression given by recent events in the UK, politicians are not blind to money either. Something that is good for industry (and cannot be characterised as tax dodging) attracts political attention. This applies whether it is the UK government seeking to assist UK industry by having the UPC (and particularly the UP) open as soon as possible – or the German government seeking to reduce costs for German companies doing business in the UK. Where there’s a will, there’s a way: and where there is wonga, there is will. I have to say, I find the tone of the introduction patronising and xenophobic. but then I’m English, so I’m in the European minority. If Brexit really happens, there is a long list of topics to be dealt with in negotiations and I sincerely doubt that the UPCA will be a “pawn” in this game. Our VCs wouldn’t spent a dime with the UPC even with the UK on board. Legal Security? Nope! – Does that mean we could loose the IP (=our investment) in ONE court that nobody knows how they are deciding (and by which exact rules)?!? True European? Nope, at least Britain, Switzerland and Spain are missing from the “imoportant” or “big” countries. Even Pharma was like “Well, we might test the sytem with one or two less important families”. If one wants to promote “European Patents” cut the annual fees! They are what is responsible for the biggest part of the costs. 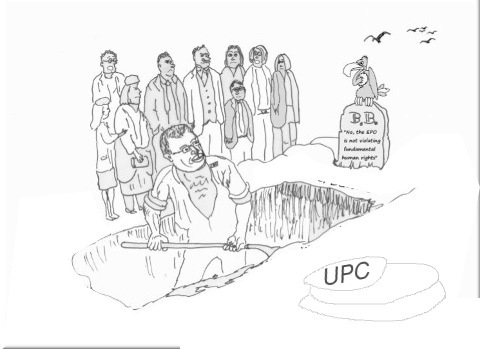 “Trust me when I say that Pharm will not touch the UPC with a bargepole,” said the following person. Those that say “we may test the system…” aren’t really part of the decision-making processes. Hence why they spend their time hob-nobbing at conferences on the UPC. Yes I have spoken to those outside the UK – and found the greatest interest outside Europe to be from the USA, particularly from CFOs of small to medium sized companies who want as big a portfolio as they can at the lowest price. However, by talking to some of those who control the purse strings, I have become convinced that there is a real demand. Buy four, get perhaps 20 free, is a message that stirs the accountant’s soul (if they have one). I can second Meldrew’s information. Most of the US companies are happy to exchange having to go to several separate European courts (all of these unknown to them) to one central European Court (also unknown to them). The negativism towards the UP and UPC reminds of old times at the start of the EPC, when everybody was negative and wanted to keep with the old national system. Or, if you want a stronger comparison, at the time of the introcution of the car or the train or any technological development. People tend to be quite conformistic and don’t want a change. I predict here, that if the system starts, after ten years everybody will say that it has been an enormous success. The bottom line here is that the UPC is not needed (except for the sake of those who invested in its passage), the UK is unlikely to ratify it (because of Brexit at the very least), and UPC might never become a reality anywhere in Europe because it was drafted with London in mind and this whole house of card is now falling.